Examines the business dynamics and strategies used by firms that recognize the transformative power unleashed by the revolution of software platforms, a revolution that will change both new and old industries. David S. Evans wrote:All rights reserved. No part of this book may be reproduced in any form by any electronic or mechanical means (including photocopying, recording, or information storage and retrieval) without permission in writing from the publisher. An electronic version of this book is available under a Creative Commons license. Software platforms are the invisible engines that have created, touched, or transformed nearly every major industry for the past quarter century. They power everything from mobile phones and automobile navigation systems to search engines and web portals. They have been the source of enormous value to consumers and helped some entrepreneurs build great fortunes. And they are likely to drive change that will dwarf the business and technology revolution we have seen to this point. Invisible Engines examines the business dynamics and strategies used by firms that recognize the transformative power unleashed by this new revolution--a revolution that will change both new and old industries. 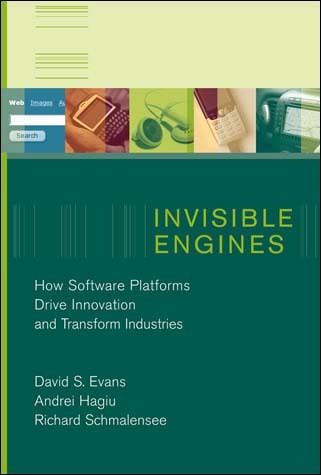 :) "Invisible Engines is one of the best investments a technology related venture capitalist can make and is a must read for anyone contemplating creating, leading or investing in an organization involved in the technology sector." :) "I would highly recommend it to any slightly economically-curious business person or even for someone who is just interested in investing in IT markets - great overview."